The French Style Baby Cardigan pattern is from bebeknits on Etsy. It was a fun and easy pattern to knit. I modified it only a tiny bit by going with one button instead of two, and adding a little single crochet edging on the neck, front edges, and hem. The only discrepancy I found in the pattern is that it called for 100 grams of yarn for the smaller size, and I ended up needing almost twice that amount. Better to go by yardage I think, but it all worked out. I found some really nice, old abalone buttons on Ebay, and one was enough, since it's a really big button. 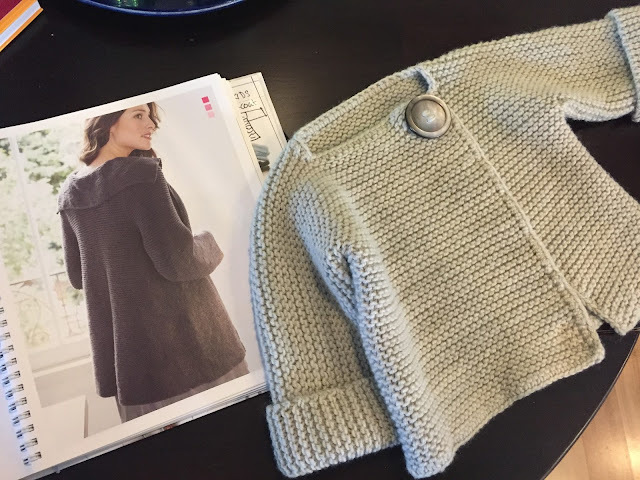 Once I was finished knitting, I held my breath, crossed my fingers, and threw it in the washing machine, and then the dryer. It came out just great. It didn't shrink or change shape, and the yarn bloomed a bit, making it nice and soft and a teensy bit fuzzy. The final touch was to add the little heart tag, which is from Etsy seller, mountainstreetarts. For this, I cut the full-size tag down, and only used the heart. It's tiny and sweet, and just the right little bit of extra love - as if it needed it. Wow!!! 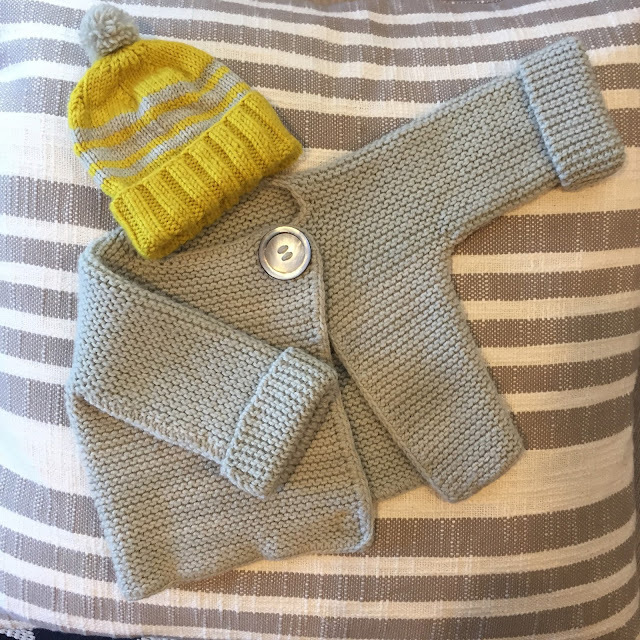 That baby sweater is gorgeous!!! What a wonderful heirloom for your grandson to hand down. You are sooooooo talented, I’m very impressed !!!! Glad you all like it! Maybe we should each do our own grown up version and get together for a show-off party!